The nation-state figures as a fundamental principle in immigration studies in that the movement of people across sovereign territories comprises a denition of immigration. As a result, nation-states consider immigration to be a matter of national constitution and security. Examples from Japanese American history illustrate those observations. Sovereignty, a convention derived from Westphalia (1648), advances the nation-state, of relatively recent construction, as comprised of territory (land) and people (subjects and citizens). Those we understand to be social constructions located in place and time; nation-states have histories. Moreover, we know that nation-states are constituted discursively (as in a narrative of nation) and materially. Several myths emanate from that discourse, including the nation’s people as forming a single, unitary race (from “nation” meaning birth or blood). In the United States citizenship is a matter of birth (jus sanguinis), and Japanese migrants, like other people of color, tested that myth of nation. Another aspect of the sovereign nation-state challenged by Japanese migrants to and in the United States includes the central historical fiction of the U.S. as a nation of immigrants. Of course, that historical interpretation arises from a basic falsehood; the U.S. narrative of nation refuses its true origins—an invasive presence of mainly British imperialism in North America. Land was gained through the conquest and expulsion of American Indians. In its place arises the narrative of immigration as the main force in the constitution of the nation’s people. Japanese migration, like other labor migrations of Africans and Latinxs, belies that myth of the sovereign nation-state. 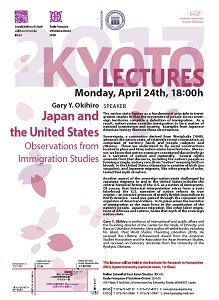 Gary Y. Okihiro is professor of international and public affairs and the founding director of the Center for the Study of Ethnicity and Race at Columbia University. He is author of twelve books, including his latest, Third World Studies: Theorizing Liberation (2016). He received the Lifetime Achievement Award from the American Studies Association and the Association for Asian American Studies, and received an honorary doctorate from the University of the Ryukyus, Okinawa.